A research team lead by University College London (UCL) Professor John Deanfield, followed over 3000 participants over a fifteen-year period (3,191) middle-aged volunteers, who were given ultrasound in 2002 to measure the intensity of the pulse travelling towards their brain. Over the next 15 years, researchers monitored the participants memory and problem-solving ability. According to the research a five minute scan of blood vessels in the neck during mid-life predicts cognitive decline a decade before symptoms appear, according to new research co-funded by The British Heart Foundation. The findings were presented recently at the American Heart Association’s AHA Scientific Sessions conference in Chicago. The study’s findings would need confirming in larger stuides, but the scan could potentially be used n future to help doctors identify patients who might be at high risk of developing dementia earlier than previously possible. Those participants with the highest intensity pulse (top quarter) at the outset of the study were approximately 50 per cent more likely to exhibit accelerated cognitive decline during the next ten years when compared to the rest of the participant cohort. The researchers controlled factors which might also contribute to cognitive decline, like age, BMI, blood pressure and diabetes. The Department of Health and Social Care has released Homelss: duty to refer, for staff or clinical teams who meet and asses patients. A new report: Shifting the centre of gravity, sets out the LGA’s refreshed, shared vision and the actions that will help local systems to progress their work on system-wide transformation. The report includes case studies on six localities – Croydon, Dorset, North East Lincolnshire, Nottinghamshire, Plymouth and Rotherham – and an evidence review of good practice which includes many case examples (Source: Local Government Association). Evidence shows that community engagement interventions have a positive impact on a range of health outcomes across various conditions. 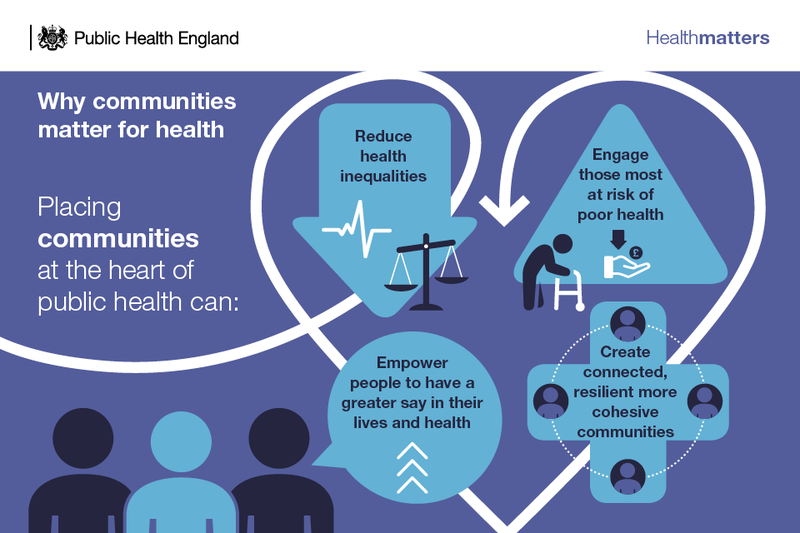 Recent NICE guidance on Community Engagement signals the importance of working in partnership with local communities to plan, design, deliver and evaluate health and wellbeing initiatives. For the NHS, the Five Year Forward View highlighted the need to ‘fully harness the renewable energy of communities’ as part of a greater emphasis on prevention. The community contribution of volunteers and residents active in their neighbourhoods is also important for local government. From a public health perspective, involving people in volunteer and peer roles can help strengthen social networks and offers a means to access and connect with groups at risk of social exclusion. These guides are aimed to help health and social care colleagues to take prompt practical actions and use every opportunity to prevent delayed transfers of care. Through using these guides, health and social care staff can address the evidence that staying in hospital for longer than required drives adverse outcomes for patients. Today (15 November) is World Pancreatic Cancer Awareness Day, Pancreatic Cancer Europe & United European Gastroenterology have released Pancreatic cancer across Europe: Taking a united stand. Pancreatic cancer has the lowest survival rate in Europe. Patient outcomes have been largely static for the last forty years, in contrast to the improved outcomes in the treatment of other cancers. past thirty years, over 90,000 EU citizens die from pancreatic cancer every year. Forecasts predict that this dreadful disease shows no sign of relenting either, with the number of cases and deaths both estimated to increase by 40% by 2035 (Source: Pancreatic Cancer Europe & United European Gastroenterology).